Post here if you require help or have information that may assist others with their MX-5. I had a similar thing wih my Turbo Impreza many years ago and te Aberdeen garage matched the price. 5 litres fully synthetic Castrol, new oil filter, new sump plug washer, cleaned air filter, no gearbox oil change as car has only done 22,000 miles, carried out all other normal service list checks - no problems found. Even included OBD check printout. Total £30. MOT at D&G Autocare, Dunfermline - £29. no issues. Grand total - £59 - Result. OK I bought my brother a bar lunch as a thank you but have not added this to the service cost as I had one too. Arnold Shark is a well known pirate so why bother. Drew, I know that the garage trade outside of main dealers in good faith do not change diff and gearbox oil but at the next service I would do both as they both carry large wear metal loads from the first 15,000 miles. 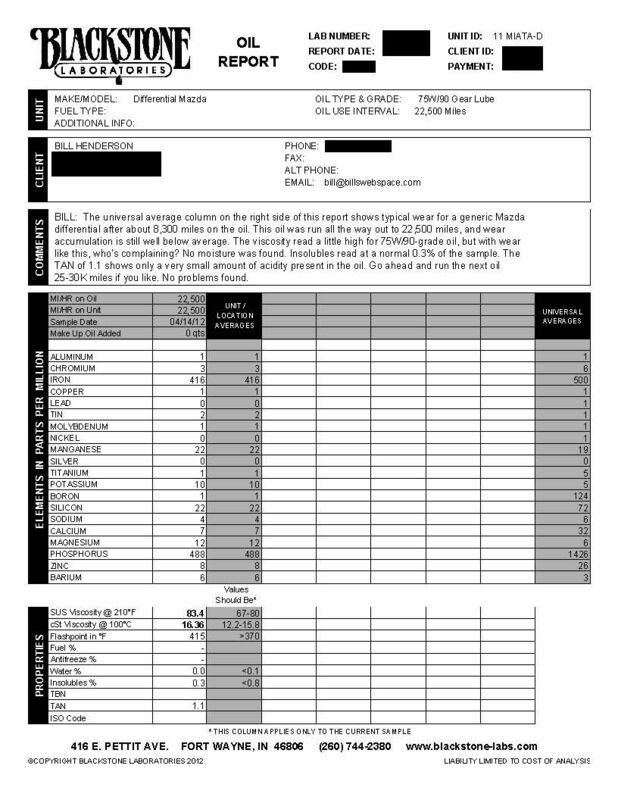 This is a gearbox used oil analysis from an NC at 22,000 miles, notice the first three wear metals on the list, as it gets lower in the list it is additive metals being reported. You will also note the oil has sheared out of spec. The next one is the diff, look at the iron number, it is very high at 22,000 miles. In this case the oil is holding up well but I would not want that amount of iron in the diff oil. I may elect to change my Mk1 diff lube. It's only coming up for a quarter century old and done 143,000 miles.